Last of the catch-up posts! 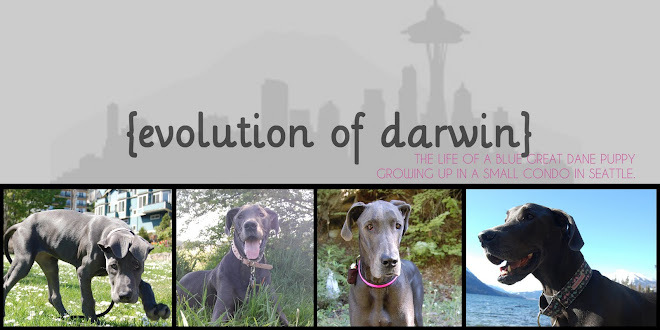 When we first started this blog Darwin was already almost 8 months old, so we had some back tracking to do to document the first 8 months of her life. This will be the last of those "pre-blog" posts. Woo hoo! Late September, we still have a decent amount of sun in the afternoons in Seattle, so we took one of the last opportunities to run Darwin at the park after work. We headed over to Discovery Park since it's the closest to us and maximizes our sun time. We let her off leash to run free chasing Jason and her tennis ball. We noticed a lady walking towards us with a small dog, so we quickly leashed Darwin as she's not supposed to be off leash and most small dog owners are afraid of a big puppy hurting their dog. As she got closer though, she let her dog off leash and we let the two dogs play. I think the small dog had a crush on Darwin. Darwin's not much of a fetcher, so she watched her new friend fetch her ball for her. The sun was starting to go down, and Darwin's new friend had to go home, so we continued on our way. We watched the sun set and then headed home. ***We'll be off on vacation so there will be no blog posts for the next few days. Hope everyone has a happy and safe Thanksgiving holiday! We'll be back with stories and pictures of our weekend adventures! Any guesses to Jason's favorite college football team? Yes. The fighting Irish of Notre Dame. Our Saturdays are spent watching college football game after college football game with the highlight (or lowlight) being ND games. Few more posts and then we'll be all caught up with Darwin's first 7.5 months! While this year has be pretty crappy with the recession, one good thing that came out of it was half day Friday's during 3 months this summer which equaled a 10% paycut. Paycut's are no fun, but getting time some hours off each week is a good trade off, especially during the summer months when it's beautiful here. This particular Friday I took Darwin to Golden Gardens park for some play time. She found a hole that had been dug, and claimed it as her own. As she entertained herself with the hole, I entertained myself with this fuzzy yellow caterpiller. After a while another puppy, a Mastiff mix Mangus, showed up who liked the hole just as much as Darwin. They continued to play in and on the hole the rest of the time. I worried about twisted ankles and broken legs, so when they ran off, I got a shovel and filled in the hole. Of course they tried to dig it up again, but that was quickly put to a stop. We have an adventure planned for this upcoming Thanksgiving weekend so we wanted to test out Darwin's reaction to snow to get prepared. We headed East on I90 towards Snoqualmie looking for a snowy area for Darwin to explore. We had snow chain issues (why are chains so hard to put on?!) so didn't get to anywhere too snowy, but found a little rec area that had some slushy snow on the ground and figured it would be good enough for our little experiment. We put on her coat and headed out to explore. She was a little nervous about it at first, but soon was willing to check it out. She liked to find holes in the snow cover and stick her nose in it. Soon we found a hill of dirt covered in snow and let her off leash to play on it. She had a blast. Zoomies all over the hill. She was a total snow bunny. We were relived that she actually enjoyed the snow, but decided to head out after a short time cause it was raining and getting cold. Since she only got a short time to romp, we headed over to Marymoor so she could get some real play time in. As soon as we got there she found a 2 year old dane, Daisy, to play with and chase. During our loop around the park she met this German Shepherd pup to play with. On our way out, we met the cutest big 5.5month old European dane... can't remember his name, but he's a cutie! At 5.5months he's almost as tall as Darwin, but a lot more stocky. As we were nearing the exit we passed an older brindle dane and found out she was 11.5 years old! That's an old dane! And she looked good for her age! We hope Darwin lives a long life like that! One thing I feel we need to work with Darwin on is her confidence. She can be such a scaredy cat. She's fine going up to random people to say hi when she wants to, but when people want to say hi to her, she sometimes gets scared and barks and backs away. A lot of the time it's people with hats on that freak her out. What's the best way to teach her these people aren't scary? Last week when I took her to Marymoor, there was a guy in the grass throwing the ball for his dog and Darwin was scared of him. Barked, whined, jumped around. I went over to stand by the guy to show her there wasn't anything to be scared of, and he tried to take off his hat and kneel down to say hi, but she would come close and then run off. It was funny to the guy and I, but also frustrating. It's worse when people want to say hi to her and she gets scared and barks because then they think she's mean and she's really not! Advice? The weekend after camping, we took another weekend trip, this time down the Oregon coast to visit some friends at Seal Rock. It was a long drive in traffic, we left Seattle at 130 and by the time we got there it was close to 830pm. The next morning after breakfast we walked down to the beach to check it out. Darwin was very excited to run on the beach, though a little nervous about all the fog. Jason and Megan decided to climb some rocks to check out the view from above, and Darwin was so upset she was stuck on the sand. She paced back and forth and cried and whined. It was pathetic. Finally she walked around and found a spot low enough she could jump up. Of course when it was time to get down, Darwin was a little freaked out about that too, and it took a bit of time for her to be willing to jump down the way she jumped up. We took a walk down the beach, but couldn't see much due to the fog. We headed into Newport for the afternoon, and after some beer and gin tasting at Rogue headed to the old town to walk around. There was a pier that overlooked an area with lots of seals. All the barking of the seals scared Darwin, and she didn't want to set foot on the pier. It took a few tries but she finally did it. The next day we headed to another stretch of beach. It was pretty empty so we got to play some fetch, which Darwin will do about 3 times before she stops. As we walked down the beach some lazy owner didn't pick up their dogs poop, and it got stepped in. So while I attempted to bury it so no one else could step in it, Darwin supervised Jason's shoe cleaning. We walked a bit further, then headed back. It was going to be another long drive home and so we headed out. Darwin was pooped from all the excitement of the weekend. Darwin's nose! Taken on our drive to go camping. This past August we packed up the car and went camping for the first time! We headed out East to a spot our friends knew of... a little secluded spot on a lake. We got there after a three or so hour drive and set up camp. As soon as we were set, Darwin and Juneau wanted to check out the lake. Juneau played fetch, while Darwin waded. Darwin was brave and hopped on a log with Sajo, but slipped off as she tried to pass him and was so embarrassed after she didn't want to go back in the water. The dogs played and avoided the fire and soon it was bedtime and Darwin was happy to come into the tent with us. She slept on my sleeping bag through the night and not on her bed, so though the tent could hold 6 people, we took up about 1/3 of it. In the morning it was a bit chilly so I wrapped her up in the blankets. She soon heard Juneau outside and wanted out so they could play. After a yummy breakfast made by Jason, Sajo went fishing in the lake, and Jason, Darwin and I took a trek around the lake. It was naptime for the pups, so they both went in their respective tents and rested for a bit. It was a fun weekend in the outdoors, and we'll need to do it again next summer!